In an apparent move to ease tensions in Gaza with a gesture toward unity in the Palestinian liberation movement and efforts to garner support from Gulf Arab states and Egypt, on 01 May 2017 Hamas released a new charter that took a softer stance on negotiations with Israel while still backing the right of oppressed peoples' to wage armed resistance. The new statement accepted a future Palestinian state based on 1967 borders in the West Bank and Gaza Strip, a longstanding goal of its main political rival within the Palestinian Liberation Organization, the Fatah movement, led by Palestinian Authority President Mahmoud Abbas. While it continued to refuse to recognize the state of Israel, it distinguished between the group’s objection to Zionism rather than Jewish people. It also cut off its association with the Muslim Brotherhood, as Gulf Arab states and Egypt both label the Brotherhood as a terrorist organization. Israeli authorities, however, rebuked the news, stating that while the PLO's more radical wing is willing to take steps toward peace, Israel continued to insist on a maintaining a hostile stance toward the occupied territories and a potential peace process. "Hamas is attempting to fool the world but it will not succeed," said David Keyes, a spokesman for Israeli Prime Minister Benjamin Netanyahu. There are two major political currents within the "HAMAS (in Arabic, an acronym for "Harakat Al-Muqawama Al-Islamia" -- Islamic Resistance Movement -- and a word meaning courage and bravery): a nationalist current, consisting of many moderates who might be willing to compromise, and ideologues influenced by the Muslim Brotherhood, with whom compromise was impossible. HAMAS, which includes military and political wings, was formed by the late Sheik Ahmad Yasinat at the onset of the first Palestinian uprising or Intifadah in late 1987, as an outgrowth of the Palestinian branch of the Muslim Brotherhood. The armed element, called the Izz al-Din al-Qassam Brigades, conducts anti-Israeli attacks, including suicide bombings against civilian targets inside Israel. Social-political elements engage in "Dawa" or ministry activities, which include running charities and schools, fund-raising and political activities. A Shura council based in Damascus, Syria, sets overall policy. Since winning Palestinian Authority (PA) elections in 2006, HAMAS has taken control of significant PA ministries, including the Ministry of Interior. HAMAS formed an expanded, overt militia called the Executive Force, subordinate to the Ministry. Hamas contains within its ranks factions supportive of al-Qaeda globally, and locally sympathetic to Salafist Islamist Abdel Latif Mousa, who died in the course of a raid by Hamas security forces on the Rafah mosque he commandeered in August 2009. Despite Hamas action against Mousa, Ahmad Ja'bari and his third-generation military wing retained ties to a number of radical Islamist groups inside the Gaza Strip, including the Dughmush clan, the Army of Islam, the Popular Resistance Committees, and the Nasser Salah al-Din Brigade. No effective nationalist (as opposed to Islamist) competition to Hamas exists inside the Gaza Strip. Other nationalist forces cannot confront Hamas because of its military capabilities. Hamas has assumed total control in Gaza, and even Fatah has no strength to fight Hamas. Hamas does not want reconciliation. They don't believe in power-sharing, because Hamas's political vision precludes coexistence with others. On October 2, 2009, Damascus-based Hamas politburo chief Khaled Meshaal said the following in a speech commemorating the anniversary of the liberation of Jerusalem from the Crusaders by 12th-Century Islamic leader Saladin (Salah al Din): "As the Crusaders' occupation of Jerusalem ended, the occupation of the city by the Zionists will end.... [J]ust as the Crusaders failed over many decades to falsify the facts of history and geography, so too do the Zionists today fail to falsify their claim to history, the land, and geography. Palestine and Jerusalem will remain Arab and Islamic, God willing." On January 26, 2006, Hamas won a stunning victory in the Palestinian parliamentary elections that gave it a decisive majority in the legislature. Election officials say Hamas won 76 of the 132 seats in parliament, while the Fatah party, which had dominated Palestinian politics for decades, secured only 43. By winning a significant majority in parliament, Hamas was in a strong position to oppose negotiations with Israel and support a greater role for Islam in the everyday life of Palestinians. Immediately after the election, the Middle East Quartet (the United States, Russia, the European Union (EU), and the United Nations) indicated that assistance to the PA would only continue if Hamas renounced violence, recognized Israel, and accepted previous Israeli-Palestinian agreements, which Hamas refused to do. As a result, in early April 2006, the United States and the EU announced they were halting assistance to the Hamas-led PA government (humanitarian aid would continue to flow through international and non-governmental organizations). The EU has been the PA's largest donor since it was created in 1996 under the Oslo peace accords. At the same time, Israel began withholding about $50 million in monthly tax and customs receipts that it collects for the PA. In 2005, international assistance and the Israeli-collected revenues together accounted for about two-thirds of PA revenues. In addition, the PA lost access to banking services and loans as banks around the world refused to deal with the fear of running afoul of U.S. anti-terrorism laws and being cut off from the U.S. banking system. The resulting fiscal crisis left the Hamas-led government unable to pay wages regularly and deepened poverty levels in the Palestinian territories. The government was forced to rely on shrinking domestic tax revenues and cash that Hamas officials carried back from overseas. Press reports indicated that much of this cash emanated from Iran. By the end of 2006, tensions in the West Bank and Gaza Strip were rising as living conditions deteriorated and PA employees, including members of the security forces, went unpaid for weeks or months. Armed supporters of Fatah and Hamas clashed repeatedly, trading accusations of blame, settling scores, and drifting into lawlessness. More than 100 Palestinians were killed in the violence. After months of intermittent talks, on February 8, 2007, Fatah and Hamas signed an agreement to form a national unity government aimed at ending both the spasm of violence and the international aid embargo that followed the formation of the initial Hamas-led government. The accord was signed by PA President and Fatah leader Mahmoud Abbas and Hamas political leader Khalid Mish'al in Mecca, Saudi Arabia, after two days of talks under the auspices of Saudi King Abdullah. Under the agreement, Ismail Haniyeh of Hamas remained prime minister. In the new government, Hamas controled nine ministries and Fatah six, with independents and smaller parties heading the remainder. Among the independents are Finance Minister Salam Fayyad, an internationally respected economist, and Foreign Minister Ziad Abu Amr, a reformer and ally of President Mahmoud Abbas. The marriage was short lived, however, as tesnsions between the rival Palestinian factions escalated. The new government was still unable to lift the economic embargo and living conditions continued to deteriorate. As each side jockeyed for position during the ensuing power struggle, fighting finally broke out in May. A series of cease fires could not stem the violence and by June turmoil had gripped the cities. The streets became the scenes of gruesom public executions and local government officials were forced to shut down businesses, schools, and public offices. As the situation worsened President Abbas sacked Prime Minister Haniyeh and dissolved the government on June 14, 2007. After he declared a state of emergency Abbas swore in a new cabinet under the leadership of Salam Fayyad on June 17, 2007. Ismail Haniyeh said he planned to ignore the decree issued by Abbas and would continue to operate as if his government were still in place; but the international community threw its support behind Abbas. In addition to receiving the backing of the Arab League and the European Union, both Israel and the United States announced that they were prepared to lift the financial and economic sanctions against the PA since a new government had been formed bereft of Hamas. Prior to 2005, HAMAS conducted numerous anti-Israeli attacks including suicide bombings, rocket attacks, IED attacks, and shootings. The group curtailed terrorist attacks in February 2005 after agreeing to a temporary period of calm brokered by the PA, and ceased most violence after winning control of the PA legislature and cabinet in 2006. After HAMAS staged a June 25 attack on IDF soldiers near Kerem Shalom that resulted in two deaths and the abduction of Corporal Gilad Shalit, Israel took steps that severely limited the operation of the Rafah crossing. HAMAS maintained and expanded its military capabilities during this time. HAMAS has not directly targeted U.S. interests, although the group makes little or no effort to avoid targets frequented by foreigners. In June 2007, after Hamas took control of Gaza from the PA and Fatah, the Gaza borders were closed and Hamas increased its use of tunnels to smuggle weapons into Gaza, using the Sinai and maritime routes. Hamas has since dedicated the majority of its activity in Gaza to solidifying its control, hardening its defenses, building its weapons caches, tightening security, and conducting limited operations against Israeli military forces. Since taking power in 2007, Hamas has continued its gradual campaign to impose Islamic values on Gazan society, Ging said. However, Hamas leaders have stopped short of overt enforcement of Islamic values (such as decrees) in an attempt to portray themselves as a "moderate" alternative to Salafist groups. More subtle methods are employed, such as "religious police" questioning unchaperoned couples and women wearing "inappropriate" attire. In August 2009 Hamas-run public schools began requiring female secondary school pupils to wear the hijab, a head scarf, and the jilbab, a long-sleeved dress. So far, the results were measurable. Seventy percent of Gazan women now wear the hijab, compared with only 30 percent in the 1980s. Male teachers and administrative staff were forbidden to work at girls' schools, and the same rule applied to female teachers and staff concerning boys' schools. Another pillar of Hamas' strategy is to seek international recognition and legitimacy. Hamas leaders claimed that Israel's international reputation was badly damaged during the 2008 Op Cast Lead Gaza conflict for the cost of "only 1,300 Palestinian lives." Israeli soldier Gilad Shalit was held for more than five years by the Palestinian militant group Hamas. Hamas demanded that Israel free hundreds of imprisoned Palestinians in exchange for Shalit. Proof that Shalit was alive came in October 2009, when Hamas gave Israel a video showing him reading a statement while holding up a Gaza newspaper dated September 14, 2009. Israel objected to demands for the release of some prisoners convicted of deadly attacks against Israelis. But in the end, some of these prisoners were included in the exchange. In October 2011 Israel and Hamas – with Egypt's help – agreed to exchange 1,027 Palestinian prisoners in exchange for the one soldier. Hamas fought a 23-day war with Israel from late December 2008 to January 2009. From November 14-21, 2012, Hamas fought another war with Israel during which it claimed to have launched more than 1,400 rockets into Israel. Prior to the confrontation, approximately 750 rockets had been fired into Israel from Hamas-governed Gaza, including one that killed three civilians in Kiryat Malachi. Despite the Egypt-mediated ceasefire between Israel and Hamas in 2012, operatives from Hamas and Palestine Islamic Jihad coordinated and carried out a November bus bombing in Tel Aviv that wounded 29 people. In 2013, the Government of Israel continued to hold Hamas, as the dominant organization in effective control, responsible for the attacks emanating from Gaza; and Israeli officials point to these attacks as additional proof that Hamas has not abandoned terrorism. 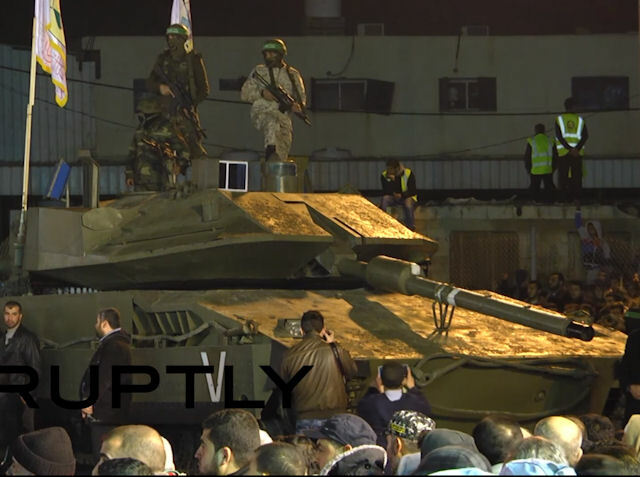 The memorial service for seven Hamas fighters killed by a tunnel collapse about in early June 2016 featured a piece of military hardware shown off by the movement’s military wing Izz ad-Din Al-Qassam Brigades. The ceremony was aired by Hamas's Al-Aqsa TV. 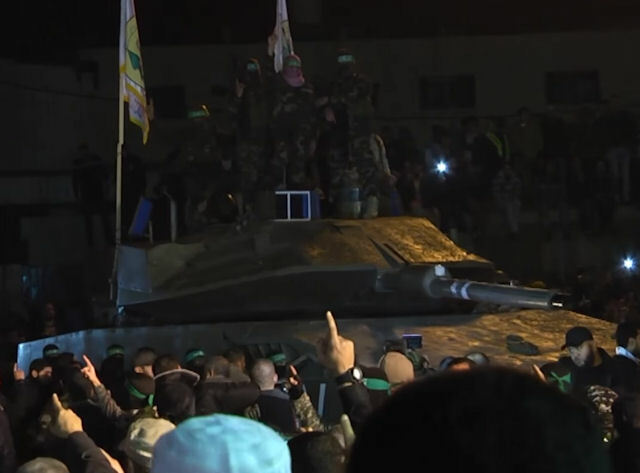 “The Tufah neighborhood [in Gaza] has a long history with enemy tanks and therefore we’re preparing for the day we shall meet those tanks,” Al-Qassam Brigades speaker said according to the Middle East Media Research Institute (MEMRI). 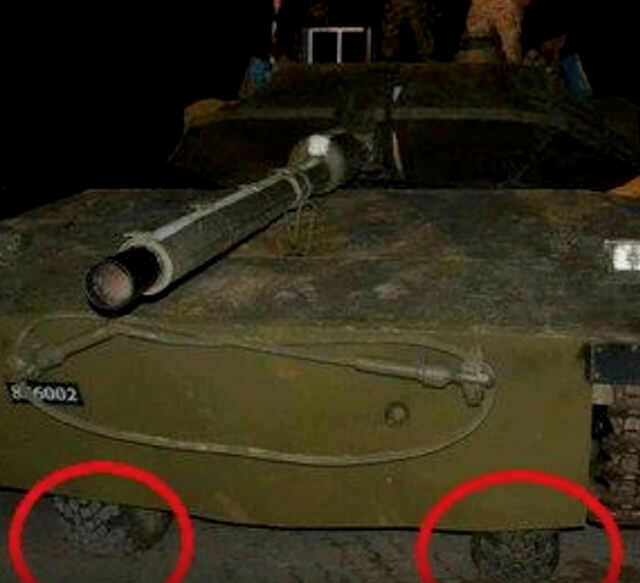 “Let the locally-produced vehicle move forward.” The war machine showed off by Hamas is a fake, senior Israeli official Ofir Gendelman stated. He believed the 'tank' is in fact a wooden replica, planted on another, less intimidating vehicle. The picture of ‘tank on wheels’ triggered a storm of giggles on Twitter. Some, such as anonymous pro-Israel blog Elder of Ziyon, suggested that the construction was in fact a fiberglass carcass with a car inside it - a parade float. Ahmed Eleiba, writing for al-Ahram on 20 July 2014, reported "The Ezz Al-Din Qassam Brigades, for example, can be regarded as a “standing army” consisting of some 7,000 soldiers. In other words, it is structured hierarchically and militarily like a standing army, to the degree that its soldiers receive a monthly salary equivalent to about $700 (although these salaries have been affected by the repercussions of recent inter-Palestinian political developments). Nevertheless, the number of people bearing arms and able to participate in combat in the Qassam Brigades, alone, may be as high as 25,000. Similar numbers would be distributed among the Quds Brigades, the military wing of the Islamic Jihad Movement, the Abu Ali Mustafa Brigades belonging to the Popular Front for the Liberation of Palestine (PFLP), the National Resistance Brigades, the military wing of the Democratic Front for the Liberation of Palestine (DFLP), the Mujahideen Brigades, which broke away from Fatah, and other smaller paramilitary groups." During the 1990s the HAMAS had an operational presence in every major city within the Palestinian territories and focused its anti-Israeli attacks on targets in those territories and Israel. The group retained a cadre of leaders and facilitators that conducted diplomatic, fundraising, and arms smuggling activities in Lebanon, Syria, and other states. By 2010 the HAMAS presence in Judea and Samaria was reduced, while its presence in Gaza was greatly enlarged.